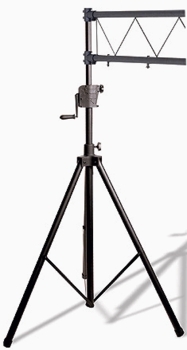 Odyssey LTMTS1PRO Crank Up Stand DJParts - All Variety of Parts that DJ Needs. Our portable 10' span aluminum/steel constructed crank truss sytsem makes it that much easier to get your lighting up and running in no time. Utilizing an ingenious internal gear system rather than cables not only makes it safer to use but makes for worry free use for years and years. Full cranking height reaches 8.5 feet and can handle an evenly spread load of 200 lbs.